Hemingway’s depression was brain chemistry, drinking, and aging. His paranoia was focused on the FBI. As Hotchner admitted in his New York Times op-ed, he believed his friend’s fear of the feds was akin to psychosis. 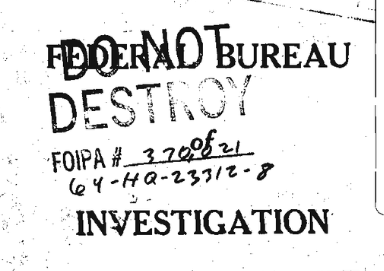 Decades later, in response to a Freedom of Information petition, the F.B.I. released its Hemingway file. It revealed that beginning in the 1940s J. Edgar Hoover had placed Ernest under surveillance because he was suspicious of Ernest’s activities in Cuba. Over the following years, agents filed reports on him and tapped his phones. The surveillance continued all through his confinement at St. Mary’s Hospital [for electroconvulsive therapy]. It is likely that the phone outside his room was tapped after all. The FBI file includes another clipping added in 1974 about a Hemingway documentary, and then is ended. The Federal Bureau of Investigation hounded Hemingway, perhaps contributing to an already fragile mental state, therefore contributing to his suicide. They essentially end their file on him with a priggish nobody taking a drizzly piss on the author’s grave. I am not a Hemingway fanboy. I like a good declarative sentence but writers need to find their own styles and aping any single great writer can lead to the death of creativity. There is a bit of a cult around Hemingway’s style, in particular. I understand it to some degree, but not completely. I’ve also sometimes found Hemingway’s work annoying and it can easily lend itself to parody. And he may have been a posturing, macho egomaniac. He didn’t mind that perception, anyway. But on the 54th anniversary of his suicide it’s hard to read about his death and not be angry. Angry at suicide, which struck my family. Suicides leave such emotional devastation behind. Angry for Ernest Hemingway. No one made him pull a trigger. His own spiraling inner chaos did that. Yet the paranoia he felt was merited. He was living in a dystopia and unwanted eyes were watching him, which is crazy enough to consider now that there are still people who venerate that era as some sort of American idyll between wars and periods of severe social upheaval. The paranoid certainty he was being tailed and watched was in 1961 perhaps more of a danger then to a high-profile world traveler like Hemingway. That the feds of that time targeted any famous person whose associations they found suspicious is pretty well-known today. Wonder what Hemingway would have made of the world we live in now. He might have started handing out shotguns like party favors.